In writing this blog I come across a pretty horrifying number of news reports about people killed or injured while walking, but this story about a teenage girl and her mother hit last month in a Florida crosswalk has stuck in my mind ever since I first read it a few weeks ago. Orly Ohayon and her mother Esther Benzohar Ohayon, both Orthodox Jews, were walking to services on the eve of Yom Kippur when they were struck by a car. As observant Jews, they were prohibited from using electronics--like the walk button that triggers a longer crossing time when pedestrians are present--during the holiday. Thus they had less than 20 seconds to cross an 8-lane road (quick math: based on industry standards they needed at least 30 seconds). Sadly, if predictably, they didn't make it to the other side safely: Orly was critically injured when hit, and her mother was killed. Aside from the obvious gut-wrenching aspects, I think this story has been hard to forget because it highlights three key weaknesses in the way we currently look at street design and pedestrian safety. Streets, sidewalks, public spaces: they mean different things and are used in different ways depending on the population they serve. It's important for planners and decisionmakers to acknowledge those differences, and tailor roadway designs accordingly. 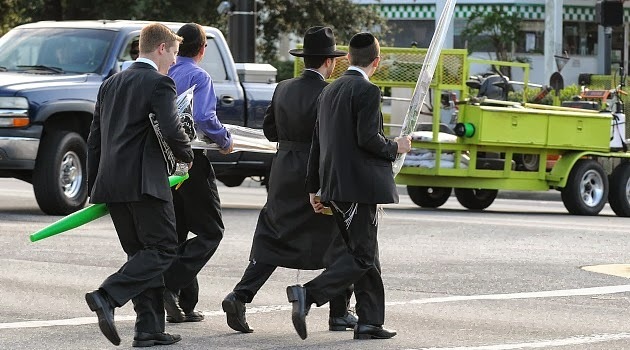 Following the Jacksonville crash there were a flood of suggestions about how to make crossings safer for observant Jews while respecting their religious practices, but this was a neighborhood that already had a large Jewish population--there should have been steps taken to address the issue before someone was killed. Several potential safety improvements were mentioned in the story, from pedestrian overcrossings to high-tech sensors that detect when someone wants to cross the street, but no one seemed to be considering the obvious one: eliminate the push-button. In other words, modify the traffic signal timing to allow adequate crossing time every time, without a pedestrian having to do something to trigger the longer signal. Yes, that would mean vehicles would have to wait longer at the signal. Yes, sometimes (maybe even most times) it's okay to sacrifice intersection through-put in the name of pedestrian safety. If it's really such a burden, the signal could be tweaked so that the crossing time is only extended during Shabbat and Jewish holidays.